Verräter , Marcel-Andre Casanola Merkle, Adlung Spiele, 1999. 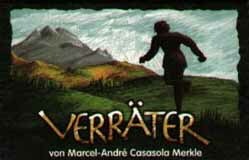 Verräter (Traitor) is a sophisticated strategy game for 3 or 4 players. What's most interesting is that this inexpensive game is simply a deck of cards, yet it has all the tough decision-making of a bigger more expensive board game. I've played enough times to witness many excellent play strategies, but unfortunately my opponents have been quick to defeat me using these strategies. It has made me an excellent post-battle general, dissecting my mistakes and recognizing my blunders. This is fine by me. It leaves me hungry for the next game where hopefully my slow-to-gel ideas can take advantage of the situtation. First, let me explain the basic mechanics of play in order to lay the groundwork for some strategies. In Verräter , each player assumes the role of a supporter in a battle between the Eagle and Rose royal houses. Initially, player allegiances are evenly divided between the royal houses, but allegiances can change as the game progresses: hence the name Traitor . Twelve land cards (woods, rivers, towns, etc.) are placed in the shape of a clock face in the center of the gaming table, again with an even division of allegiances to the Eagle and Rose royal houses. This layout forms the unique "board" upon which many of the cards are played. As the game progresses, players take sides in the conflicts, attempting to profit and take away victory points. In any conflict between adjacent lands, players contribute supply cards that add points to the two sides of the conflict. Here, it is advantageous to move last because one has a better awareness of the supply cards and the conflict forming on the table. After each player has had a chance to contribute, the conflict points are tallied and a victorious side is declared. The losing land must flip its allegiance from one house to the other. The victors of the conflict receive victory points according to a chart on the defeated land card. The victory point chart is based on the number of players, so that many points are gained if you are the sole victor, and few or no points are gained if all four players are on the winning side. It is advantageous and prestigious to win alone. the builder who gets to build a guest house which increases your income. the farmer who reaps exactly 3 supply cards this turn. the strong diplomat who adds 5 conflict points to the battle. the weak diplomat who adds 2 conflict points to the battle. However, this crafty diplomat garners one extra supply card. the traitor who switches allegiance to the opposing royal house. The last card is the most interesting. After players have contributed supplies to the conflict, the action cards are revealed and the traitor switches allegiance, moving the the traitor's supply contribution to the other side of the conflict. The results are always entertaining and quite profitable if the traitor guesses correctly. On the other hand, players are always trying to guess the traitor and a poker-faced bluff comes in handy here. The back-stabbing can be quite painful for some - excellent for others! And so the game progresses in this manner for 8 turns (9 turns for 3 players) or until the 12 lands are all showing the same allegiance. It is possible to win conflicts with large amounts of supplies, but the supply income is limited, so one finds it is important to be frugal. Those are the basic rules, now onto the strategies. Notice that the conflicts can only occur in boundaries between opposing royal houses. This may be obvious, but when selecting your initial guest house, the more valuable spots are the lands bounded by similar allegiances. This makes the land safer from enemy attack. In a similar vein, higher value lands are easier to defend, so these make more valuable locations for the guest house. Don't try to defend similar valued lands. You must contribute lots of supplies to defend in these situations. The strategist action card allows you to pick the conflict. Choose the strategist action when you are ready to go to war. If you are the starting player, avoid selecting the traitor action card. Likewise, beware the starting player who plays many supply cards for the battle. In our games, it has been extremely difficult to conceal the traitor action, especially for me the worst bluffer in the world. When the starting player throws down loads of supplies, it is a sign that something is up. Most likely it is a sign that their supplies are going to the other side. One final bit of strategy. If all players align with the same royal house, it will be very difficult to make victory points in the game. Therefore, trailing players should never switch allegiance to a house that has a plurality. When all four players support one house, they nearly always win the battles, providing few victory points and forcing the game to a speedy conclusion. What are the weaknesses of this game? Few in my eyes. For one, the English translation provided by Funagain Games leaves something to be desired, and consequently it took a bit longer for our group to learn the rules. This uncredited translation appears to be a verbatim translation of the German instructions, but it leaves many open questions in my mind. Since purchasing the game I came across Mik Svellov's translation at the Gaming Dumpster which answers many of my questions, but still is not the right size or format to pack in with the deck of cards. I intend to contribute my own translation and layout that explains the game and fits the form and size of the original package. Another gripe, this is another one of those games that doesn't do well with other than 4 players. With 3 players, the odd alligance man is usually prevented from taking the traitor action. There are not enough cards for 5 players and 2 players is somewhat pointless as it removes all bluffing and trickery from the game. Despite these weaknesses, its compact size is one of its greatest selling points. It is definitely a candidate for campers and hikers who want lots of strategy with little bulk. A final bit of praise goes to the uncredited artist who did the illustrations for the cards and the box cover. The art appears to be computer illustration, but the style is very much like grease or oil pencils. The mood of the illustrations evokes the ambiguity of the conflicts, the silouetted traitor, the stern and strong diplomats. All in all a very classy act. For its low price, compact size, sophisticated strategy, and high enjoyment, this game is highly recommended. [an error occurred while processing this directive] Last modified: Thursday, 09-Jun-2011 12:37:13 MST.